The Islamic Unity is the most important issue which concerns all Muslims in accordance with their degrees and social positions. Because The Islamic Unity is not a political issue only. This Unity starts from the bonds and solidarity between two Muslims due to their brotherhood-in-faith and reaches to the cooperation and mutual assistance among all Muslims throughout the entire Islamic World. Our Religion, our nation, our countries can only be protected from all kinds of dangers and enemies through the enormous Power which will be generated by the religious brotherhood and solidarity of Muslims and this will serve to the general Global Peace. That is the reason why the enemies who cannot resist against this material and spiritual Power (admin: “just like Gaza Victory over so-called super power slaughterer zionist israel”), try to destroy the Unity and the Solidarity of the Islamic World in order to break this power into parts, using all types of trickery and stratagems. 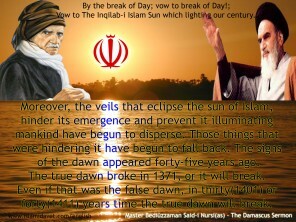 Therefore, we must stay vigilant against the corruptive incitements of such defeatists and learn the meaning and the contents and the importance of the Islamic Brotherhood which was commanded very seriously by our Religion and we must display zeal to act in accordance with this Brotherhood. The Religion of Islam has brought important duties and rules which result in Mutual Assistance. For example, the Pilgrimage (Hajj) is of utmost importance for developing the Spirit of Mutual Assistance and the Unity of Muslims. “The dream came to silence at the Pilgrimage. Because, the negligence of the Pilgrimage and the Wisdom in it has attracted , not the calamity, but the (Divine) Wrath and Compulsion (Qahr). And its penalty did not help the expiation of sins, but rather made our sins excessive. It is the negligence of the High Politics of Islam and the extensive Social Benefits within the Pilgrimage, which comprehends especially the Unity of Opinions through acquaintanceship, and Cooperation through mutual assistance, that negligence paved the way for Enemies to employ millions of Muslims against Muslims. Look here! The Tatar and the Caucasian understood that the person they helped others to kill was their helpless Mother, when it is too late. They are crying now at her feet. Look ! The Arab killed his Hero Brother by mistake, and he even cannot cry being perplexed. Look ! The African killed his brother unknowingly, now he is raising a cry of lament. Here ! The World of Islam ! They unintentionally and heedlessly helped others to kill their Flag-bearer Son (the Ottoman Turk), now they are tearing out their hair like mothers in sighs and wailings. Hence a great wisdom in Pilgrimage (Hajj) ; it is a kind of Supreme Consultation (Assembly) to be held once a year, in order to protect and perpetuate the independence and security of the World of Islam. Lawful freedom (Hurriyet -ul Shar’iya) and lawful consultation (Mashwarat- ul Mashruah) have demonstrated the sovereignty of our true nationhood. And the foundation and spirit of our true nationhood is Islam. And in so far as they have carried the standard of the Ottoman caliphate and Turkish army in the name of that nationhood, the two true brothers – Arab and Turk, who are like the shell and citadel of the nationhood of Islam, are the sentries of that sacred citadel. Why doesn’t Turkish PM erdogan attack israel the way he attacked Syria, Iraq?